The Greyhound Project celebrates April as National Adopt a Greyhound Month through a nationwide initiative promoting adoption information and public service announcements. Since 2009, the campaign has helped to promote greyhound adoption — and you can help spread the word this year! 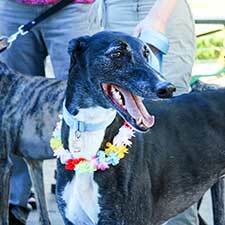 Celebrate Adopt a Greyhound Month three ways! Benefit GPA Wisconsin with every amazon.com order you make, at no cost to you. With GPA-WI meet & greets happening across the state, you’re sure to find one close to you. Stop by with your hound(s), meet other volunteers and greyhounds, answer questions and discuss with the public why greyhounds make great pets! Find a meet & greet near you: click here. Make sure to tell your social media sphere about greyhounds this month! Watch the GPA-WI Facebook page for greyhound adoption information throughout the month of April. Follow the GPA-WI Facebook page: click here.